Raymond K. Cross, M.D., M.S., A.G.A.F., F.A.C.G. is a Professor of Medicine, Division of Gastroenterology and Hepatology, at the University of Maryland, Baltimore. He is also Director of the Inflammatory Bowel Disease Program at the University of Maryland School of Medicine and is Co-Director of the Digestive Health Center at the University of Maryland Medical Center. Dr. Cross received his undergraduate degree from Washington and Jefferson College and his medical degree from the University of Pittsburgh School of Medicine. He completed his postgraduate training in Internal Medicine and Gastroenterology at the University of Maryland and Baltimore VA Medical Center. In addition, Dr. Cross obtained a Master of Science degree in Clinical Research at the University of Maryland School of Medicine. Dr. Cross has authored over 100 journal articles, reviews, and book chapters. His research interests include application of telemedicine in the care of patients with IBD, disparities, outcomes research and clinical trials. He is Co-Chair of the Clinical Research Alliance, past Chair of the Clinical Awards Committee and Patient Education Committee, and was recently selected as vanguard site investigator for SPARC IBD for the Crohn’s and Colitis Foundation. 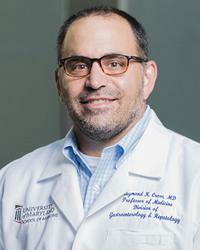 Member of UM Faculty Physicians, Inc.